For the theater, see Paper Mill Playhouse. For academic papers, see Academic paper mill. Historical investigations into the origin of the paper mill are complicated by differing definitions and loose terminology from modern authors: Many modern scholars use the term to refer indiscriminately to all kinds of mills, whether powered by humans, by animals or by water. Their propensity to refer to any ancient paper manufacturing centre as a "mill", without further specifying its exact power drive, has increased the difficulty of identifying the particularly efficient and historically important water-powered type. The use of human and animal powered mills was known to Chinese and Muslim papermakers. However, evidence for water-powered paper mills is elusive among both prior to the 11th century. The general absence of the use of water-powered paper mills in Muslim papermaking prior to the 11th century is suggested by the habit of Muslim authors at the time to call a production center not a "mill", but a "paper manufactory". Scholars have identified paper mills in Abbasid-era Baghdad in 794–795. The evidence that waterpower was applied to papermaking at this time is a matter of scholarly debate. In the Moroccan city of Fez, Ibn Battuta speaks of "400 mill stones for paper". Since Ibn Battuta does not mention the use of water-power and such a number of water-mills would be grotesquely high, the passage is generally taken to refer to human or animal force. Stromer's paper mill, the building complex at the far right bottom, in the Nuremberg Chronicle of 1493. Due to their noise and smell, papermills were required by medieval law to be erected some distance from the city walls. An exhaustive survey of milling in Al-Andalus did not uncover water-powered paper mills, nor do the Spanish books of property distribution (Repartimientos) after the Christian reconquest refer to any. Arabic texts never use the term mill in connection with papermaking and the most thorough account of Muslim papermaking at the time, the one by the Zirid Sultan Al-Muizz ibn Badis, describes the art purely in terms of a handcraft. Donald Hill has identified a possible reference to a water-powered paper mill in Samarkand, in the 11th-century work of the Persian scholar Abu Rayhan Biruni, but concludes that the passage is "too brief to enable us to say with certainty" that it refers to a water-powered paper mill. This is seen by Leor Halevi as evidence of Samarkand first harnessing waterpower in the production of paper, but notes that it is not known if waterpower was applied to papermaking elsewhere across the Islamic world at the time. Robert I. Burns remains sceptical, given the isolated occurrence of the reference and the prevalence of manual labour in Islamic papermaking elsewhere prior to the 13th century. Hill notes that paper mills appear in early Christian Catalan documentation from the 1150s, which may imply Islamic origins, but that hard evidence is lacking. Burns, however, has dismissed the case for early Catalan water-powered paper mills, after re-examination of the evidence. The identification of early hydraulic stamping mills in medieval documents from Fabriano, Italy, is also completely without substance. Clear evidence of a water-powered paper mill dates to 1282 in the Spanish Kingdom of Aragon. A decree by the Christian king Peter III addresses the establishment of a royal "molendinum", a proper hydraulic mill, in the paper manufacturing centre of Xàtiva. This early hydraulic paper mill was operated by Muslim Mudéjar in the Moorish quarter of Xàtiva, though it appears to have been resented by sections of the local Muslim papermakering community; the document guarantees them the right to continue the way of traditional papermaking by beating the pulp manually and grants them the right to be exempted from work in the new mill. The first permanent paper mill north of the Alps was established in Nuremberg by Ulman Stromer in 1390; it is later depicted in the lavishly illustrated Nuremberg Chronicle. From the mid-14th century onwards, European paper milling underwent a rapid improvement of many work processes. The size of a paper mill prior to the use of industrial machines was described by counting the number of vats it had. Thus, a "one vat" paper mill had only one vatman, one coucher, and other laborers. By the early 20th century, paper mills sprang up around New England and the rest of the world, due to the high demand for paper. At this time, there were many world leaders of the production of paper; one such was the Brown Company in Berlin, New Hampshire run by William Wentworth Brown. During the year 1907, the Brown Company cut between 30 and 40 million acres of woodlands on their property, which extended from La Tuque, Quebec, Canada to West Palm, Florida. “Log drives” were conducted on local rivers to send the logs to the mills. By the late 20th and early 21st-century, paper mills began to close and the log drives became a dying craft. Due to the addition of new machinery, many millworkers were laid off and many of the historic paper mills closed. Paper mills can be fully integrated mills or nonintegrated mills. Integrated mills consist of a pulp mill and a paper mill on the same site. Such mills receive logs or wood chips and produce paper. The modern paper mill uses large amounts of energy, water, and wood pulp in an efficient and complex series of processes, and control technology to produce a sheet of paper that can be used in diverse ways. Modern paper machines can be 500 feet (150 m) in length, produce a sheet 400 inches (10 m) wide, and operate at speeds of more than 60 miles per hour (97 km/h). The two main suppliers of paper machines are Metso and Voith. It has also become universal to talk of paper "mills" (even of 400 such mills at Fez! ), relating these to the hydraulic wonders of Islamic society in the east and west. All our evidence points to non-hydraulic hand production, however, at springs away from rivers which it could pollute. Al-Hassan and Hill also use as evidence the statement by Robert Forbes in his multivolume Studies in Ancient Technology that "in the tenth century [AD] floating mills were found on the Tigris near Baghdad." Though such captive mills were known to the Romans and were used in 12th-century France, Forbes offers no citation or evidence for this unlikely application to very early papermaking. The most erudite authority on the topography of medieval Baghdad, George Makdisi, writes me that he has no recollection of such floating papermills or any papermills, which "I think I would have remembered." ^ a b Burns 1996, pp. 414f. Donald Hill has found a reference in al-Biruni in the 11th century to stones "fixed to axles across running water, as in Samarkand with the pounding of flax for paper," a possible exception to the rule. Hill finds the notice "too brief to enable us to say with certainty" that this was a water-powered triphammer. Thomas Glick warily concludes that "it is assumed but not proved" that Islamic Xàtiva had hydraulic papermills, noting that the pertinent Arabic description was "a press." Since the "oldest" Catalan paper is physically the same as Islamic Xàtiva's, he notes, their techniques "can be presumed to have been identical" - reasonable enough for Catalan paper before 1280. My recent conversations with Glick indicate that he now inclines to non-hydraulic Andalusi papermaking. Currently Oriol Valls i Subin't, director of the History of Paper department of the Museos Municipales de Historia in the Instituto Municipal de Historia at Barcelona, has popularized a version of that thesis, in which Christian paper mills multiplied marvelously along the Catalan rivers "from Tarragona to the Pyrenees" from 1113 to 1244. His many articles and two books, valuable for such topics as fiber analysis in medieval paper, continue to spread this untenable and indeed bizarre thesis. As Josep Madurell i Marimon shows in detail, these were all in fact cloth fulling mills; textiles were then the basic mechanized industry of the Christian west. Fabriano's claim rests on two charters - a gift of August 1276, and a sale of November 1278, to the new Benedictine congregation of Silvestrine monks at Montefano. In each, a woman recluse-hermit gives to the monastery her enclosure or "prison" - Latin carcer; misread by Fabriano partisans as a form of Italian cartiera or paper mill! There is no papermaking in these documents, much less hydraulic mills. ^ a b c Burns 1996, pp. 417f. ^ Thomas F. Glick (2014). Medieval Science, Technology, and Medicine: An Encyclopedia. Routledge. p. 385. ^ "About Berlin: Berlin History". Archived from the original on November 9, 2012. Retrieved April 5, 2012. ^ "Monday, July 9, 1934". Honolulu Star-Bulletin. 1934. Retrieved 21 August 2017. ^ "Paper Mill Closures of America". Retrieved April 5, 2012. ^ "Urban Decay". Retrieved April 5, 2012. ^ "Metso supplied SC paper machine line sets a new world speed record at Stora Enso Kvarnsveden". Retrieved 2008-04-12. 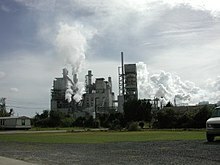 Wikimedia Commons has media related to Paper mill.